Everyone alive today was born into an electrical age, many might still not have access to it, but everybody has been touched by it. The assumption is that it will keep getting better and so far it has. It will come to a point though that the improvements will begin to exceed a humans capacity to use it. That time is coming soon for television. Sending moving images via electromagnetic waves in the form we typically consider TV kicked off in the mid-1930s. By the time it is a century old it may have progressed beyond the capacity of our eyes to notice the ever-increasing clarity and resolution. Odds are when you first watched a TV show it used standard-definition which is 576 lines to create the image. Over time that increased to 720 lines which depending on where you were might be called HD, half HD or HD Ready, which stood for High Definition. The next upgrade was to 1080 lines (you quite likely own one of these) which may have also been called HD or full HD. Newer TV sets then increased UHD, Ultra High Definition (not much room left on this naming convention) which had 2160 lines. Then we switch to the width for the name although the ratio of width to height is maintained. This is why a TV with about 2300 lines but a width of 4096 pixels which is how we get the 4K, i.e. 4 000. 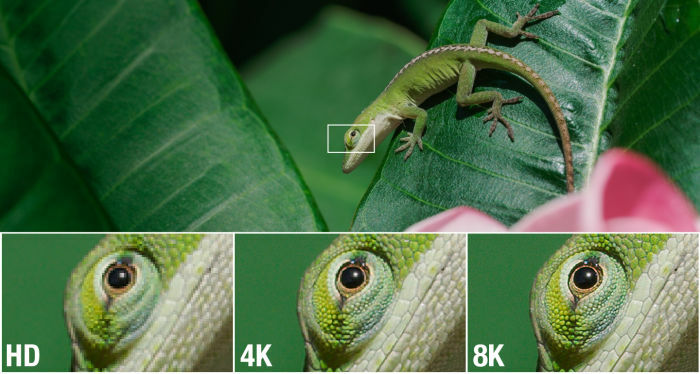 While recording equipment has been able to capture 4K resolution for a while (your smartphone probably can shoot in 4K) the cost of the TV sets of any significant size capable of displaying 4K remained expensive. Those prices have been dropping dramatically. The final obstacle which is still a considerable one in SA is how to distribute such a high-resolution signal. Ultra Blu-Ray uses this definition, but fewer and fewer people use a player. These days more people stream content. The catch is that it requires a stable and fast connection to do so, typically 25 Mbps. Not many South Africans have line speeds able to do that. Coming in 2019 are two consumer ready TVs that are able to show 8K resolution. LG and Samsung will have a screen with 7680 pixels wide and 4320 high give and eyewatering 33 million pixels capable of turning on and off and displaying one of the three primary colours. The smallest screen with still be an impressive 65 inches or 165 cm measured diagonally (all TV sizes are described this way) up to 85 inches or 215 cm! Not much will shoot in 8K initially, and you will need a very impressive 50Mbps to stream it in all its glory. You need not concern yourself too much though, as the likely R100 000 price tag will be reason enough for you to remove it from your Christmas list. But in a few years, prices would have fallen, and you may begin considering getting one or wondering if you should wait for the 16K model. This is the real point of this edition. While human eyes are not rated in pixels an approximation of what we can see is 40 megapixels where 8K is 33 megapixels. But our eyes don’t see everything in equal resolution. The high resolution is only a small circle in the middle of our vision, which would be about 7 megapixels. So while high resolution would allow us to get bigger TV sets, and it would still make lower resolutions look smoother. Anything above 8K is effectively better than our eyes can see. If a screen was made to look like a window, an unwitting human might not be able to tell that they were looking at a screen rather than through an actual window. So what you may ask! Great TV, reasonable price and you won’t have to buy a new one until yours dies which could be many years. It is good news, but there is a catch. The thing that drives innovation and allows prices to come down is the steady improvements. Companies compete to build a better telly and can then convince you to keep buying a new one, usually before you really need to. When that happens innovation slows or stops, and prices flatten out. As more products reach that limit, it could slow the entire economy. Consider your microwave. It is principally the same since the peak in evolution in the early 80s. Nobody talks about the unveiling of a new microwave or if they do it is about some other part of the machine, not the microwave itself. Stoves, fridges, mixers and most other kitchen appliances have reached the peak human need for them. You could create a fridge that can chill things to absolute zero, but you never need to, so why buy one. A stove could generate enough heat to fire pottery or melt metal, but you don’t need that either, so instead, they fade into the background. Two other darling products may be heading the same way: the car and the smartphone. Cars are super reliable and efficient. They will most likely switch to electric and become autonomous, but then it is done. We are likely to see that happen in the next decade. For countries that don’t have many cars, it will be great, but the car markets of Europe and America are going to see a slump. Before then, the mighty smartphone makers like Apple and Samsung will have created just about the perfect phone, great battery, screen and processor. Able to do everything we need it too and last for many years. Currently, new phones are released every year, but the hype around the announcements has been getting less and less. Long lines of people waiting to buy the latest iPhone are not as long anymore. That means we need something else to drive the hype and innovation and most importantly sales. The catch is there are few conveniences that till need to be addressed and those that remain might not be mass market appeal items. This is not about the decline of our electronic era, but rather a shift to new products that will get more attention. Two are wearables and smart clothing. They are already a thing, but they are still in their early days. Smart watches and mixed reality glasses are less like the Samsung Note 9 and more like the Nokia 2110. Smart clothing is still just a novelty, and both will not only look to take over some of the functions of your phone, but they will also work more like medical devices than communication tools. Despite so many products having reached not their peak, but ours, there are still many others that are not there yet and possibly others we have yet even to discover.